The Best Books of 2018: Historical Fiction! 10 Little by Edward Carey (Riverhead Books) – On its surface level, this eloquent and ferociously smart novel by Edward Carey is the fictionalized story of the young girlhood and life of Marie Tussaud. But Carey loads his narrative with witty ornamentation, frothy sub-plot complications, and most of all a surreal strangeness that's very precisely calibrated. Any novel about Madame Tussaud will inevitably be at least in some way about truth and representation, but even here Carey is cagily willing to subvert expectations. 9 Washington Black by Esi Edugyan (Knopf) – Edugyan's much-praised novel is about a young field slave whose life changes radically when he's made the manservant of an eccentric abolitionist – the first of a crowded novel's worth of life-altering changes Edugyan has in store for Washington “Wash” Black in what steadily and confidently unfolds as the best roman à clef of the season. 8 Varina by Charles Frazier (Ecco) – One of the biggest historical fiction surprises I had in 2018 was this narrative by Frazier (he of Cold Mountain fame) of the life of Confederate President and arch-traitor Jefferson Davis, on two headings: first, Frazier's writing has never before impressed me, and second, I thought, what but lachrymose maundering could possibly be wrought from Varina's life? But Frazier stopped me short on both counts, writing his most eloquent book yet and delivering a toweringly convincing fictional creation in his Varina. 7 Love and Ruin by Paula McLain (Ballantine) – If the challenge in a book like Varina is to transform a pinch-souled simpleton like Varina Howell into a compelling character, the challenge for Paula McLain (she of The Paris Wife fame) in her novel about Martha Gellhorn is the reverse: how to avoid transforming a vibrant and multifaceted person like Gellhorn into the kind of one-dimensional manqué so popular in historical fiction about independent-minded heroines. And Love and Ruin succeeds marvelously at just that: this is a novel that will bring readers a more immediate Martha Gellhorn than even the woman's own letters do. 6 The Lost Queen by Signe Pike (Touchtstone) – Signe Pike's richly atmospheric and involving debut takes readers back to the mytho-history of sixth-century Scotland and introduces them to Languoreth, another of this year's incredibly well-rendered historical heroines, a woman destined to be queen, caught between warring factions, facing the in-creep of Christianity, and encountering a hero called Pendragon. Pike imbues her setting with a lived-in sense of reality that makes her lost queen feel all the more real. 5 The Hellfire Club by Jake Tapper (Little, Brown) – CNN correspondent Jake Tapper, already the author a fine work of nonfiction (2012's The Outpost), here turns his hand to dramatizing the sordid politics of Washington in the era of Eisenhower and McCarthy, creating a wide and colorful backdrop against which he can use the story of an inexperienced Congressman to tell what is clearly his favorite kind of story: an embattled sense of Right surrounded on all sides by the insurgent forces of Wrong. This is the smartest political thriller since the heyday of Allen Drury. 4 White Houses by Amy Bloom (Random House) – Amy Bloom's novel about the long-term and passionate friendship Eleanor Roosevelt had with Lorena Hickock could have been a simple thing, despite the complexity of all three people involved. But instead, in the course of this short book's progress, wonderfully tangled portraits of Hickock, the First Lady, and, perhaps ironically, Franklin Roosevelt steadily deepen. 3 The Cloister by James Carroll (Nan A. Talese) – National Book Award-winner James Carroll outdoes even his own penchant for elaborate plotting with this multi-level novel about the ways the stories of a modern-day priest and Holocaust survivor echo, extend, and intertwine with the famous tale of Abelard and Heloise. All Carroll's characters breathe with authenticity, but in this book it's Abelard who stands out as a memorably complex weirdo. 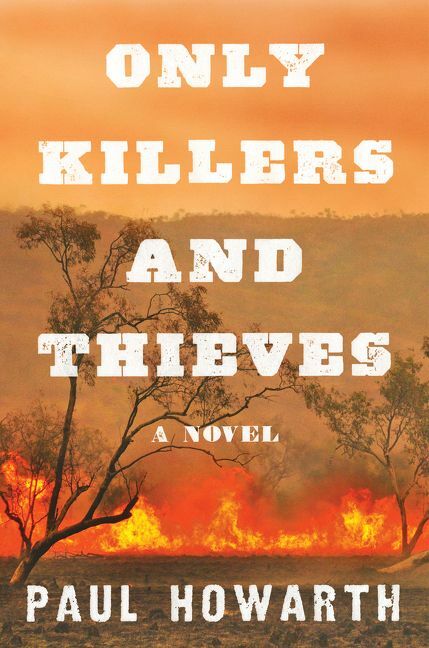 2 Only Killers and Thieves by Paul Howarth (Harper) – 1880s Australia is the sere and unforgiving setting for Howarth's remarkably accomplished debut about two teenage brothers and the tragedy that soon warps their lives out of all recognition. With sharp dialogue, sparse but vivid scene-setting, and an ingenious skill at plotting, Howarth transforms a simple revenge story into something far more sweeping. 1 The Sea Queen by Linnea Hartsuyker (Harper) – It's comparatively rare for a sequel to take the top spot on this list, but nevertheless: Linnea Hartsuyker's The Sea Queen, sequel to her terrific The Half-Drowned King, was the best historical fiction of 2018, as much for how elegantly it expanded on its predecessor as for how it stood apart. At its heart, this is a story of a strong-willed woman in the Viking era who's unhappy with any of the choice's her century provides for how she should live her life. The portrait is complex and endlessly fascinating.